We can buy everything without leaving the house now – groceries, clothes, and, apparently, even ships. Ecommerce is becoming more norm than novelty, with worldwide retail e-commerce sales reaching US$$1.915 trillion in 2016. Online consumers are spoilt for choice, and ecommerce companies are feeling the pressure to set themselves apart. Good website design, which comprises user interface (UI) and user experience (UX), strengthens your brand, streamlines your checkout, and sets you apart from the competition. It could be the difference between a disgruntled shopper and a loyal repeat customer. It can help to drive higher sales in three ways, according to Yong Wai Teng, Strategic Account Manager for APAC at Insider. Every interaction a customer has with an ecommerce platform should be intentionally designed and meaningful for the customer. Website navigation on ecommerce sites is crucial. Some companies sort products into useful categories via drop-down menus. Each screen should immediately make its objective clear to the visitor, with special emphasis on page titles and login forms. Ecommerce companies must consider investing in software that helps them track eye or cursor movements on their website to recognize areas of high visibility on their online store. Such high-visibility areas will be prime locations to showcase new products or promotions. The F-shape pattern in a heat map exists across different websites. Photo credit: Nielsen Norman Group. Online consumers seek an efficient and fuss-free experience and do not appreciate slow loading times. While companies cannot control the speed of their customers’ operating systems, they should strive to optimize page load times. According to surveys by Akamai and Gomez, nearly half of web users expect a site to load in 2 seconds or less, and every second of delay can result in a 7 percent reduction in conversions. Good ways to speed up page load times include opting for smaller images, writing in fewer jQuery and animation elements, as well as minimizing third-party resources such as ads or widgets. More crucially for ecommerce players, checkout needs to be seamless. Cart abandonment rates in APAC average 76.3 percent, higher than the global average of 74.52 percent. Consider offering payment options that accelerate the checkout process, like Paypal’s One Touch, Android Pay, and Apple Pay, which make the shopping journey smoother. It’s important to find a payment provider that limits your abandonment by keeping your checkout simple. 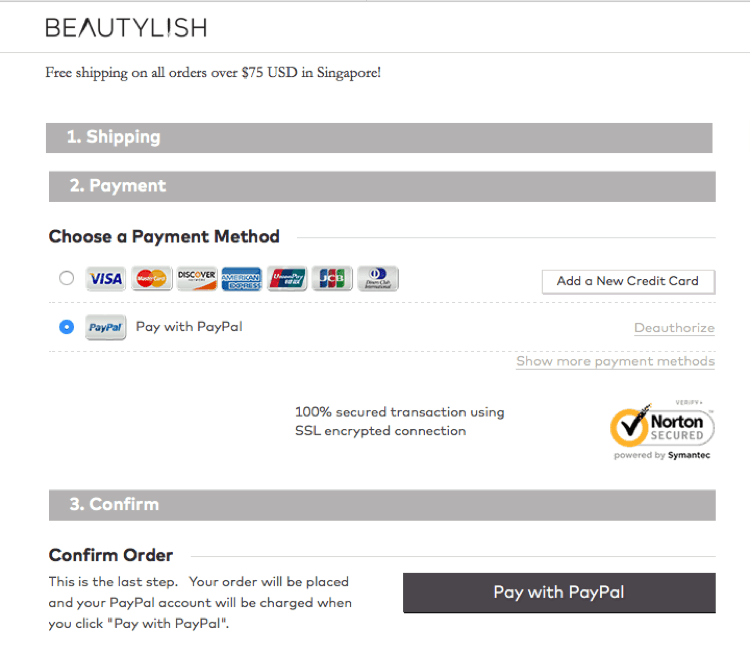 When Beautylish partnered with Braintree, customers didn’t need to go through a redirect page, and could log in with a simple prompt box. Within a month, sales were up 18 percent over their baseline. Wai Teng observes that displaying security elements more prominently on checkout pages “gives customers more assurance,” which can boost conversion rates. Payment platforms like Braintree, for example, work with Kount, fraud-detection specialiststhat detect abnormal activity to ensure that users’ information is not compromised. This also removes the need for additional steps like SMS confirmation, eliminating another potential customer drop-off point. As ecommerce grows in popularity and convenience, customer expectations will evolve and change with technological developments. “The challenge is catering to widely differing needs and expectations in a scalable way,” says Wai Teng. For an ecommerce company, staying dynamically responsive with not just website design, but also product and price, is the key to customers’ hearts.